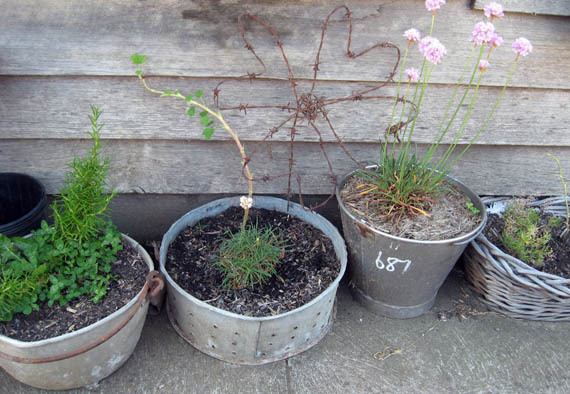 what do the internet and potted herbs have in common? I’ve been having some time off blogging. Some of it was voluntary. I actually made a decision to not blog for a few days last week. Then a couple of other days I didn’t blog cause I was too busy doing other things… like… living. Then I had some internet connection issues which caused me to mutter under my breath a lot and storm out of the office in disgust repeatedly. The internet issues are continuing currently but I’m on the netbook, connected to the modem directly via a red umbilical cord. I can’t move from this chair if I want to be online. At least I’m online, right? It would be better if I could remember my email password so I could log on to my webmail. That’s the thing when you get too comfortable with your own computer. You set up your passwords in the computer memory (probably a really bad thing if you let others on your computer!) and you log in to sites on a permanent basis. ie no need to actually remember passwords. Now I have to search for the safe place I wrote my password. But I may have the situation under control before I need to panic. Yesterday afternoon I finally snapped and called. I spoke to a nice man in India who said that the only way to get to the bottom of the problem was to disconnect the router and hardwire the computer into the modem direct. Great. That means only one computer in the house has internet access for the period. So I crawl around on my knees, unplugging bits and pieces and plugging other bits in. I won’t bore you with the details, but suffice it to say that step 1 didn’t work. I had to spend a second day, talking to another nice man in India, in order to set up the netbook to actually connect using the red umbilical cord. Now that’s working. I’ve been putting it through its paces and so far no dropouts. Step 1 seems to show that the satellite dish is working fine. That the satellite dish is interfering with the TV antenna and our reception. Why is it that when I say something is a problem I get pooh-poohed, but when someone else says it it makes sense? Anyway, on another subject entirely, I made these little hanging baskets for outside the casita a few weeks ago and never got around to sharing them. 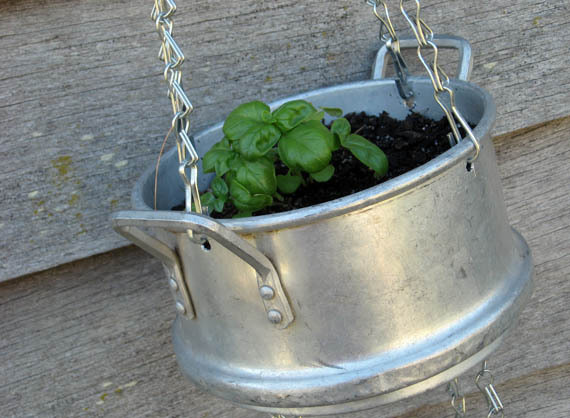 I used some old colanders I’d been collecting for a while with this project in mind, and some chains bought from the hardware store. 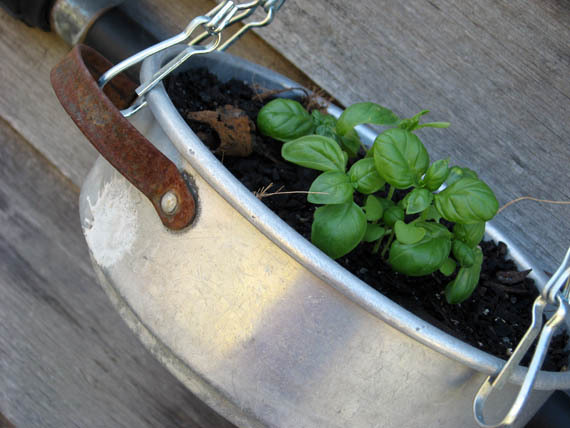 I then lined the colanders with hanging basket fibre, added potting mix and put in basil and coriander. I made one double hanging basket and 2 single ones which I hung on either side of the casita door. 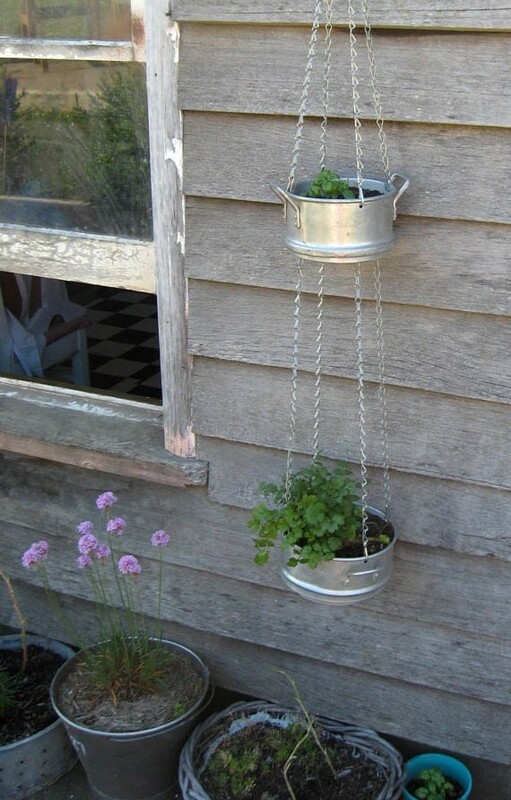 You may have noticed my collection of pot plants below the double hanging basket. I actually I had to move all my pots there to get them out of the worst of the sun before they died. 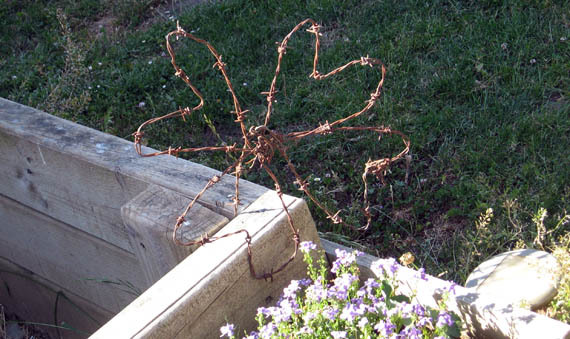 Notice the barbed wire clover Wayne made me? He called it a flower, but its a four leaf clover. That’s ok by me. I can use the luck! Anyway, this is how my plants looked 2 weeks ago. Since then the coriander has died and the basil is looking sickly. 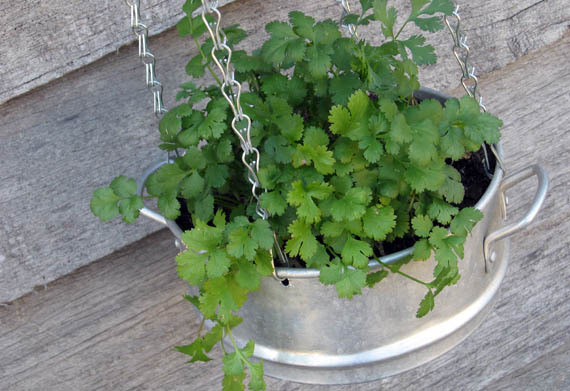 I never have luck growing herbs. I don’t know what I do wrong but they just don’t seem to like me much. I give them pretty pots to live in and they repay me by dying. This entry was posted in decorating, garden, ponderings by zefiart. Bookmark the permalink.